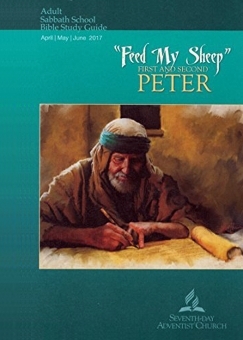 COMMENTARY ON "JESUS IN THE WRITINGS OF PETER"
The Saviour could not see through the portals of the tomb. Hope did not present to Him His coming forth from the grave a conqueror, or tell Him of the Father’s acceptance of the sacrifice. He feared that sin was so offensive to God that Their separation was to be eternal. Christ felt the anguish which the sinner will feel when mercy shall no longer plead for the guilty race. —Ellen G. White, The Desire of Ages, p. 753. There are four statements in this passage from EGW that need to be addressed individually. His disciples remembered that it was written, "Zeal for your house will consume me." 18 So the Jews said to him, "What sign do you show us for doing these things?" 19 Jesus answered them, "Destroy this temple, and in three days I will raise it up." 20 The Jews then said, "It has taken forty-six years to build this temple, and will you raise it up in three days?" 21 But he was speaking about the temple of his body. 22 When therefore he was raised from the dead, his disciples remembered that he had said this, and they believed the Scripture and the word that Jesus had spoken. When Jesus had spoken these words, he lifted up his eyes to heaven, and said, "Father, the hour has come; glorify your Son that the Son may glorify you, 2 since you have given him authority over all flesh, to give eternal life to all whom you have given him. 3 And this is eternal life, that they know you the only true God, and Jesus Christ whom you have sent. 4 I glorified you on earth, having accomplished the work that you gave me to do. 5 And now, Father, glorify me in your own presence with the glory that I had with you before the world existed. Jesus never thought that separation from the Father would be eternal. Consequently, he is able to save to the uttermost those who draw near to God through him, since he always lives to make intercession for them. We need not fear, nor spread the lie that Christ’s intercession will ever come to an end. Ellen White was, at this point in her life, a false prophet, telling lies about God and Christ. The Great Controversy, from which this teaching is found, remains as one of the primary sources of Adventist doctrine, and upon close inspection does not live up to the standard of Biblical prophecy. Christ could see through the portals of the tomb and knew of his sure resurrection. He knew the Father would accept his sacrifice. He knew that separation from the Father would not be eternal, nor could it be. There never will be a time when Christ ceases to make intercession for those that believe. Ellen White, at least at this point in her ministry, was a false prophet. Today the lesson author quotes Ellen White again, this time from The Desire of Ages, another key source for Adventist doctrine. “To the Christian, death is but a sleep, a moment of silence and darkness. The life is hid with Christ in God, and ‘when Christ, who is our life, shall appear, then shall ye also appear with Him in glory.’ John 8:51, 52; Col. 3:4. . . . [A]t His second coming all the precious dead shall hear His voice, and shall come forth to glorious, immortal life.”—Ellen G. White, The Desire of Ages, p. 787. So we are always of good courage. We know that while we are at home in the body we are away from the Lord, 7 for we walk by faith, not by sight. 8 Yes, we are of good courage, and we would rather be away from the body and at home with the Lord. Without the help of Ellen White, or ANY other author, simply allow the word to enter and find lodging in your heart. For to me to live is Christ, and to die is gain. 22 If I am to live in the flesh, that means fruitful labor for me. Yet which I shall choose I cannot tell. 23 I am hard pressed between the two. My desire is to depart and be with Christ, for that is far better. 24 But to remain in the flesh is more necessary on your account. Believers who have fallen asleep (died), will be with Christ when he returns. When we die our spiritual selves go to be with Christ. To die is gain (to be with Christ). There are no concerns observed in Wednesday’s lesson. Seventh-day Adventists include the doctrine of the Trinity as one of their 28 fundamental beliefs. Thus, we see in Peter a clear depiction of Jesus, not only as the Messiah but as God Himself. Yet the fundamental beliefs never state that the Father, Son and Holy Spirit are one being, one in essence. Not simply one in purpose, united to accomplish the salvation of mankind. The Adventist fundamental belief allows that the three persons of the Godhead are three different beings, not three persons in one being. Adventism is not as clear as the Westminster confession of faith or the Creed of Chalcedon, on the doctrine of the Trinity. The Adventist fundamental belief leaves out too much information on the Trinity that the Christian church has struggled with for millennia. Jesus is the I AM of Exodus 3:14, he is the same being as the Father and the Spirit. After reading Friday’s lesson, read these two passages to get a brief glimpse of who Jesus truly is. Copyright 2017 BibleStudiesForAdventists.com. All rights reserved. Revised April 25, 2017. This website is published by Life Assurance Ministries, Camp Verde, Arizona, USA, the publisher of Proclamation! Magazine. Contact email: BibleStudiesForAdventists@gmail.com.